Does anyone else remember the flute-like instruments called recorders that you were given in second or third grade and you learned how to play music on them? Do they still give these to kids? 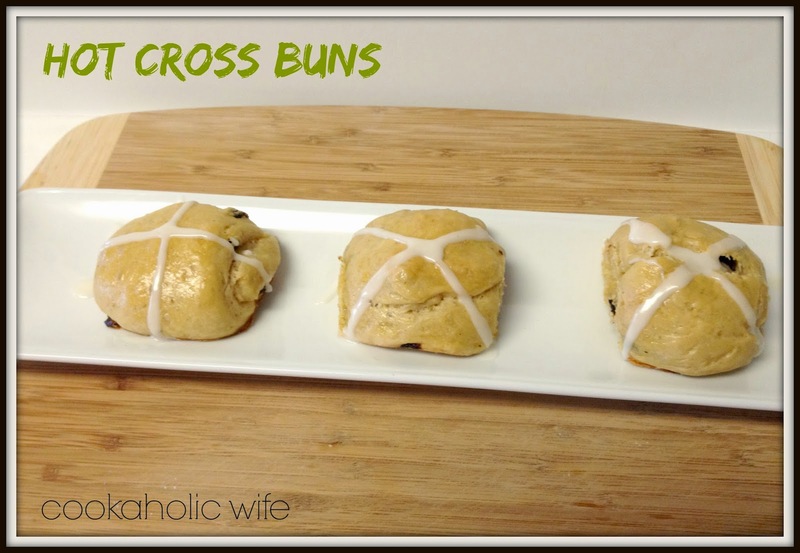 Anyway, I brought this up because when I think of Hot Cross Buns, I don’t think of an actual food or even the fact that they’re typically eaten on Good Friday. All I think about is learning how to play Hot Cross Buns on that darned recorder. 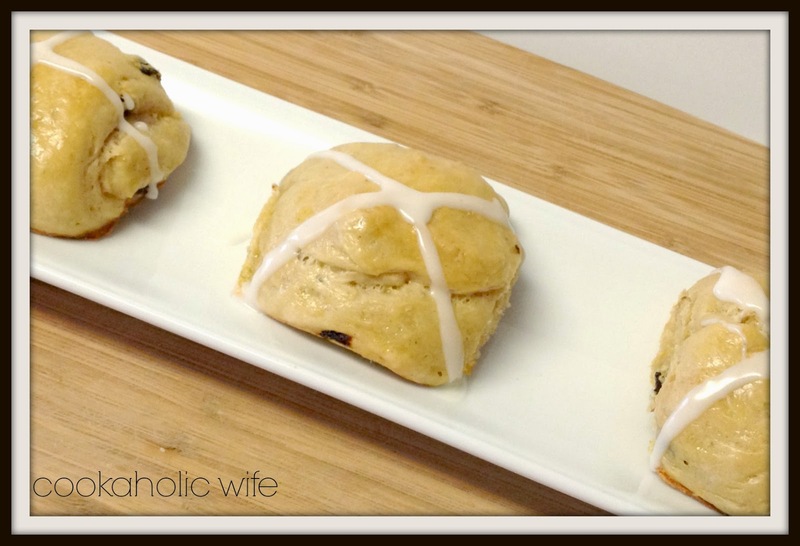 I was looking around for Easter recipes and came across these. I knew right away they were going to on my Easter menu. In other news, I am quite surprised to say that I included raisins in these. I strongly dislike raisins. I debated on putting them in the Irish Soda Bread Muffins earlier in the month and ended up putting them in there too. Which means I’ve put raisins in more recipes in the last 30 days than I have in the last 2 years. 1. Combine the milk and water in a medium saucepan over low heat until it reaches 100 degrees. Remove from the heat and sprinkle the yeast and a pinch of sugar over the liquid. Set aside and allow to foam and rise for 30 minutes. 2. Whisk the butter, egg yolk and yeast mixture together. 3. Whisk together the flour, salt, nutmeg, cinnamon, and ginger together in a large bowl. Make a well in the center of the flour and stir in the yeast mixture with a wooden spoon until a shaggy and slightly sticky dough forms. Stir in the raisins. 4. Turn out the dough onto a lightly floured surface and knead until soft and elastic. Shape into a ball. 5. Brush a bowl with butter and place the dough in the bowl, turning to coat. Cover with plastic wrap and let rise at room temperature until doubled in size, about 1.5 hours. 6. Butter a 9×13 baking dish. Turn out the dough a pat into a rectangle about 16 by 8 inches. Use a pizza wheel or bench scraper to divide the dough into 12 equally sized portions, each weighing around 2 ounces. 7. Tuck the edges of the dough under to make rounded rolls and place them seam-side down into the prepared pan. Leave a little space between each roll. Cover with plastic wrap and allow to rise until doubled in size, about 45 minutes. 8. Meanwhile, preheat the oven to 375. 9. Remove the plastic wrap and brush over the tops with the beaten egg. Bake rolls for 25 minutes or until golden brown and fluffy. Remove from the oven and cool completely on a wire rack. 10. Prepare the glaze by stirring together the powdered sugar, milk, lemon zest and vanilla until smooth. Transfer to a pastry bag or plastic bag and cut off the tip. Pipe a cross over each of the buns, once fully cooled or glaze will run and melt. These didn’t get as golden as I would have liked, but I had a bad feeling about putting them back in the oven so I opted to go with a barely golden variety of the hot cross bun. I thought these were pretty tasty and Tom loved them. I saw another recipe that calls for adding cardamom to the flour mixture and I think I’ll try that out when I make these again for Easter dinner. Yes they still do recorders in elementary school here in Oklahoma.